Geppetto D2O Provides Mezzanine Customization for All 96Boards™ | Gumstix, Inc. | Gumstix, Inc.
Now 96boards™ designers can rapidly customize, design and manufacture small form-factor mezzanine boards for the 96Boards Consumer Edition (CE) and the just announced IoT Edition (IE) in Geppetto® D20 to jumpstart their 96Boards™ hardware designs. A mezzanine connector for the 96Boards™ CE specification is already in Geppetto D2O and an IoT Edition mezzanine connector is in development. 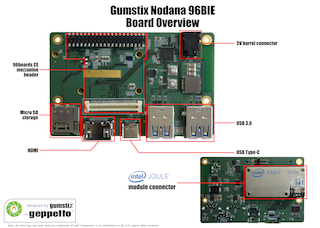 This announcement and the release of two new Gumstix boards, Nodana 96BCE and Radium 96BIE expands Gumstix’s current support for 96Boards™ and Intel® Joule™module which includes the AeroCore2 for DragonBoard 410C along with six recently released Gumstix boards supporting the Intel® Joule™ module. The Nodana 96BCE is the first x86-based 96Boards Consumer Edition (CE) board to use quad-core Atom T5700 or T5500 SoCs from Intel’s new Broxton line of Atoms via the Intel Joule computer-on-module. The 48 x 24 x 3.5mm Intel Joule module ships with an IoT-oriented Ostro Linux distribution, and integrates WiFi and Bluetooth, as well as support for Intel RealSense 3D cameras. The Radium 96BIE board is also based on an Intel COM, but not one that runs Linux. Instead, the board incorporates an Intel Curie module based on Intel’s MCU-like Quark SE processor. The Radium 96BIE complies with the new 96Boards IE spec, which is also used by a new Cortex-M4-based SeeedStudio BLE Carbon SBC. Like the Carbon, the Radium 96BIE offers Bluetooth LE, in this case enabled by the Curie module.